(CNN) -- Tamil Tiger rebels acknowledged the death of their leader Sunday, nearly a week after the Sri Lankan government said it had recovered the body of Velupillai Prabhakaran and declared victory in the country's 25-year civil war with the rebels. In this picture taken 27 November 2003, Velupillai Prabhakaran stands next to an LTTE flag. A short time after the presidential address, the military announced that it had recovered the body of Prabhakaran, leader and founder of the Tamil Tigers. The rebels initially denied the death of their leader, claiming on Tamilnet.com that Prabhakaran was "alive and safe." The defense ministry said the bodies of Prabhakaran and 18 other senior rebel leaders were among corpses found in mop-up operations, after government troops routed the Tigers -- formally known as the Liberation Tigers of Tamil Eelam. Prabhakaran founded the Tamil Tigers, who have been declared a terrorist organization by 32 countries. It initiated the use of women in suicide attacks and, according to the FBI, invented the explosive suicide belt. Prabhakaran is accused of masterminding the killing of former Indian Prime Minister Rajiv Gandhi in 1991 in the Tamil-dominated Indian state of Tami Nadu. 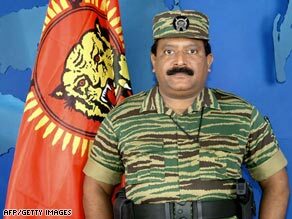 Sri Lankan authorities allege that Prabhakaran was avenging Gandhi's decision to send Indian peacekeepers to Sri Lanka. Two years later, a Tigers suicide bomber, allegedly acting on Prabhakaran's orders, detonated explosives that killed Sri Lanka's then-president, Ranasinghe Premadasa, during a rally. The rebels have fought for an independent state for minority Tamils in Sri Lanka since July 1983. An estimated 70,000 to 80,000 people have died during the quarter century of fighting.